Current solar activity, sunspot index and sunspot numbers, Observation of sunspots and solar activity forecast, prediction of the solar activity. Sunspots in the northern hemisphere and sunspots of the southern hemisphere. sunspot numbers since 1700, daily sunspot numbers since 1818. solar activity diagram, sun cycle diagrams, strong sun cycle, weak sun cycle. historical solar activity, old solar activity, new definition of solar activity. Galileo Galilei and Wolf. forecast of the next sun cycle, forecast of the next solar cycle, comparing the sun cycles. 22 year Hale cycle, 11 year Schwabe cycle, magnetic polarity, 2300 - 2400 years Hallstatt cycle, 55 years Yoshimura, 85 years Gleißberg cycle, 180 - 210 years Seuss cycle, 180 - 210 years de-Vries cycle, 1470 years cycle of Bond- and Dansgaard-Oeschger events, intensity of the solar wind, solar activity of suns backside. Maunder Minimum, Dalton Minimum, Modern Maximum, Oort Minimum, Mittelalterliches Maximum, Wolf Minimum, Spoerer Minimum. Flares and aurora, space weather, Observatory, solar telescope, SDO, Satellites, brightness of the sun, geomagnetical storms. The Zeeman Effect describes the solar magnetic field as the driver of the sunspots. Royal Observatory of Belgium by the World Data Center. The diagram shows the sunspot index of the selected year. The red line displays the sunspot index for the northern hemisphere, the blue line the index for the southern hemisphere of the sun. 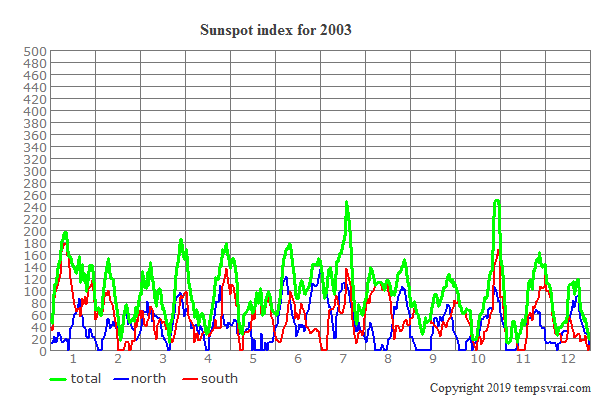 The green line represents the sunspot index for the whole visible solar disc. Note: The sunspot index cannot discribe the solar activity on the far side of the sun. Source: WDC-SILSO, Royal Observatory of Belgium, Brussels.